Archbishop Mark Coleridge, speaking at Australia’s largest Catholic eConference this week, said the time of Christendom is over, and the Catholic Church must recognise its real credential is in Mercy. Calling for Pope Francis’ Jubilee Year of Mercy to be enacted as a verb, Archbishop Coleridge said the Pope’s vision gives birth to action within the Church and across the global community. 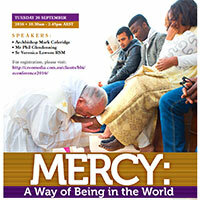 “When I speak about the covenant of God, it is a community of Mercy in a merciless world. Find the hungry one, the thirsty one, the naked one, the sick one, the one who is infinitely strange and the one who is seemingly imprisoned by the power of death. Look at the Crucified and understand what you see,” Archbishop Coleridge said. This entry was posted in Special interest and tagged Adult Faith Formation, Broken Bay Institute, eConference, Higher Education, Mercy, Year of Mercy on September 23, 2016 by ACBC Communications.